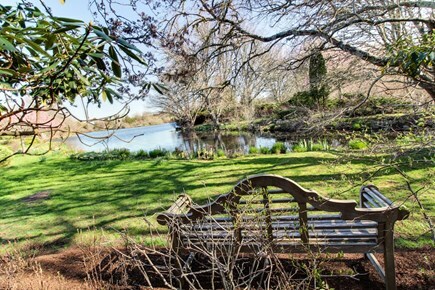 Relax amid the splendor of landscaped gardens at this beautiful West Tisbury home. 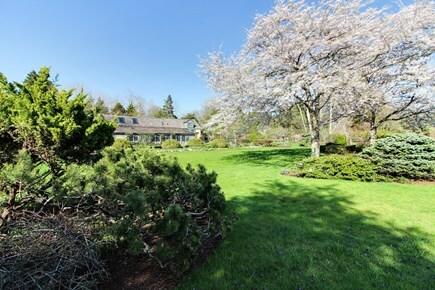 It features four bedrooms, water views, and a small private island onsite. 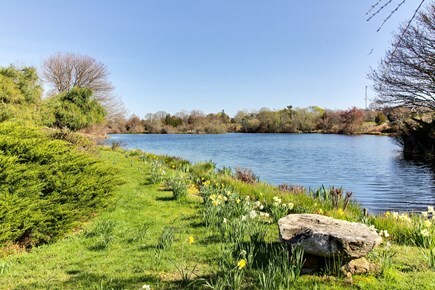 Looks Pond is one of the best kept secrets on Martha's Vineyard yet it's near all the area sites, including Manuel F. Correllus State Forest, just five miles away. 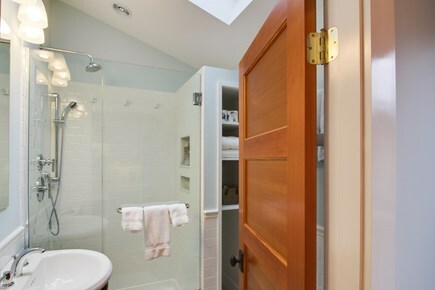 This home is connected to a larger house but still has privacy. 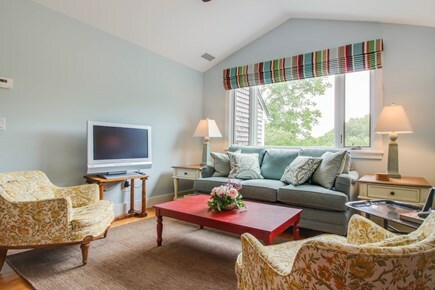 The living room gets a lot of light and features hardwood floors, floral armchairs, and a comfortable blue couch for cozy snuggles. 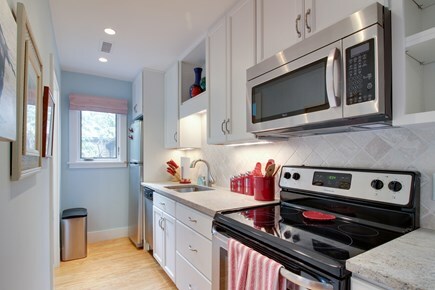 The galley kitchen has been newly remodeled and boasts a wealth of counter space, a stainless steel electric range, and a dishwasher. The wooden deck has enough elegant furniture for an al fresco dinner as well as an outdoor shower for post-beach bathing. 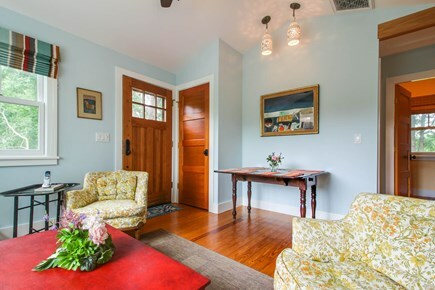 There are four bedrooms in this lovely manse. Two are on the main floor. 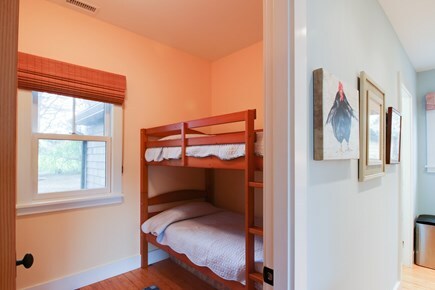 One has green walls and a queen bed and the second bedroom has twin bunk beds. 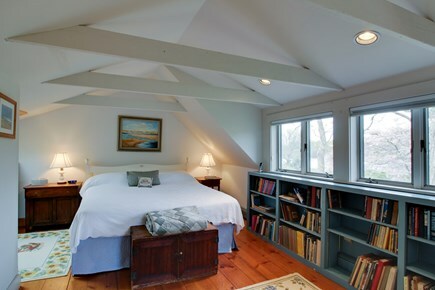 The third bedroom sits one level down and features a twin and a bookshelf. 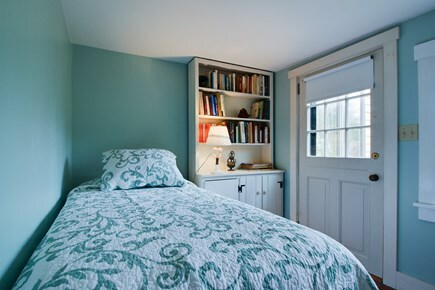 The master lies on the third level and has a king bed and built-in bookshelves. 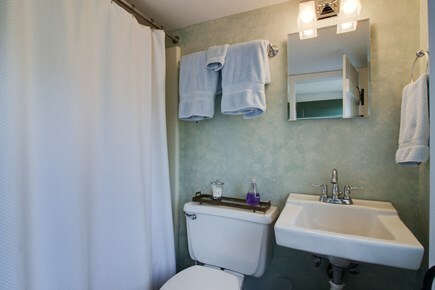 There are two full baths as well, so this home can accommodate up to seven guests (five adults at most, please). You get two adult bikes, cable TV, free WiFi, four beach chairs, and a charcoal grill. A lovely foot bridge provides access to a small, romantic private island. 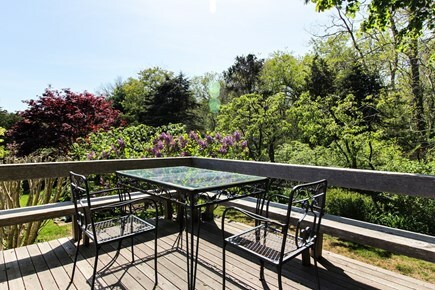 West Tisbury is one of the most charming towns on Martha's Vineyard with farmer's markets, sculpture gardens, and shopping galore. Relax at an area beach or stroll through Main Street. 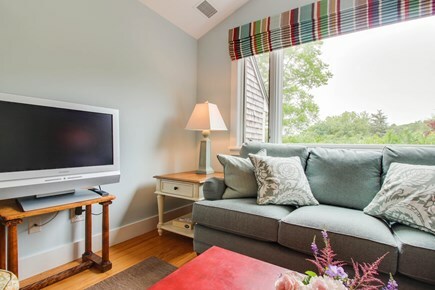 Recharge and unwind at this charming and well manicured Martha's Vineyard home. 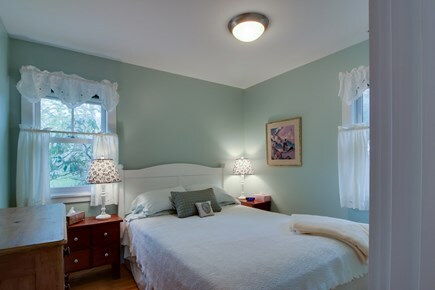 Additional pricing info: For real-time pricing information, including the cleaning & booking fees, please contact Vacasa. State and local taxes of 5.7% will apply.